BIRMINGHAM, Ala. – Grambling State senior quarterback Devante Kincade, junior linebacker De’Arius Christmas, redshirt junior punter/kicker Marc Orozco and Southern freshman Kendall Catalon were all named the Southwestern Athletic Conference Football Players of the Week for their outstanding play in week eight. 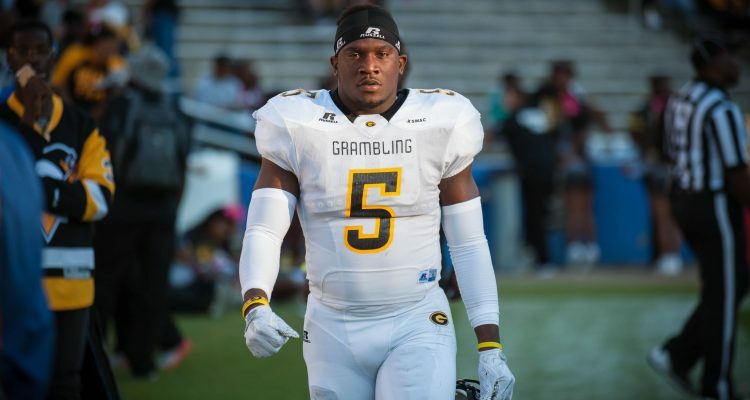 Kincade completed 17-of-26 passing for 268 yards and a pair of touchdowns in Grambling State’s 41-14 rout of Alcorn State. He also rushed four times for 11 yards and scored the game’s first touchdown on a 17-yard run. Kincade threw touchdown passes of 53 yards (Calif Samon) and 18 yards (Marquise Kaigler) in the first half as the Tigers built a 24-7 halftime lead. Christmas had a huge defensive game for the Tigers as he racked up a game-high 14 tackles (seven solo and seven assisted), including one sack (loss of eight yards). He also added one forced fumble and one quarterback hurry. He was part of a defensive unit that forced seven Alcorn State turnovers. Orozco accounted for 11 points on the day as he was a perfect 5-for-5 in extra points. He also was perfect on field goals as he booted a 40-yard field goal right before halftime to give the Tigers a 24-7 lead and in the third quarter he split the uprights on a 33-yard field goal that extended the advantage to 27-7. Catalon scored on a four-yard rush to give Southern a 20-10 advantage at Jackson State. He added an eight-yard reception in Southern’s eventual 35-17 win against Jackson State.